I’m in two minds about this CD to be honest. I love the idea of mixing down-tuned guitars with catchy sing-a-long choruses. Heavy rock meets melodic rock. The German guitarist Todd Wolf (Human Fortress) played around with that idea and was joined by Michael Bormann (Jaded Heart, Bonfire) among others and THE TROPHY was born. And yes... we do get down tuned guitars and catchy choruses now and then, but even though everything is well written and well played; it’s only a few of the songs here that have left a mark in my brain. Most of the songs are too modern and too slow for me to really get a kick out of it. 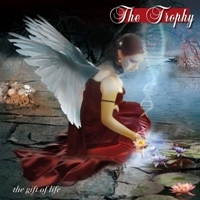 THE THROPHY is at their best with the AOR song “When The Nightmares Wake Me Up” and the excellent “Get The Cup” a song that could be a new soccer anthem. Songs such as; “Justice” and “Gloomy Days” are also solid rock songs but the rest of the tracks are not above average in my book. Fans of the melodic side of rock/hard rock music should check this album out and make up their own minds about it. So, listen before you buy.